Playdough is fun to make, but a playdough recipe leading to playdough that glows in the dark is a guaranteed success with the little ones. If you don’t tell them and make the glowing part a surprise, you can expect some funny reactions! I’ve had a few questions about where to find glow-in-the-dark-powder and you can find it here: Green Glow Pigment Powder 1oz- Green Glow in the Dark . I’ve linked to green powder but there are several other colors at the same place. Mix the ingredients in a sauce pan. Stir on low/medium heat until the playdough forms. 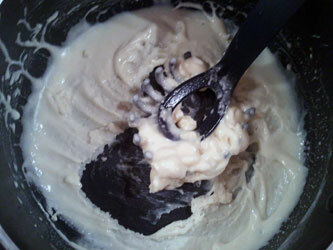 The playdough shouldn’t be sticky, if it is, add a bit more of flour. Finished, now make someone happy with the playdough. If you store the playdough in an airtight container in the fridge, it will last longer. 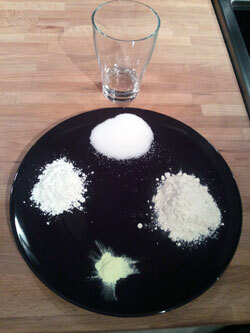 Want to try another playdough recipe? 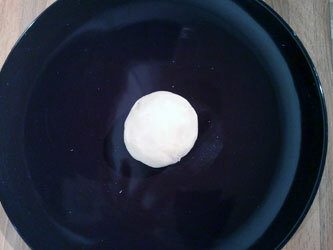 Try our rubbery playdough recipe, it’s really cool. This playdough recipe can definately create a funny surprise for the little ones. A great idea is to use it as decorations for Halloween. As with all our playdough recipes, we begin by collecting the ingredients. We have the flour, salt, water, corn starch and glow in the dark powder. The fun the final result is really depends on the glow in the dark powder, so if you want alot of glow, add more glow powder. Pour all ingredients into a pan, like below. Start stiring to mix all together. It should look something like this. Then start heating at medium heat. 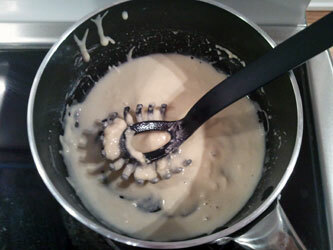 You will not see the mixture boil, it will just suddenly start to change and get the texture as the image shows below. Remember that it should’t be sticky, so if it is you have two options. 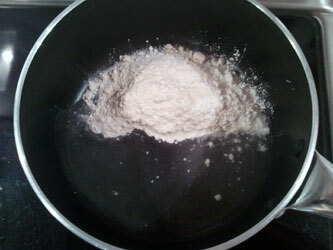 Keep heating or remove from heat and add some extra flour. The finished playdough looks really boring, but the glow powder I used worked rather well and it gave a good glow in a dark room. It’s quickly transformed from something boring to something exciting for the kids. Good luck! Glad you and your kids liked it! How cool the end result is really depends on the “glow in the dark”-powder you use. 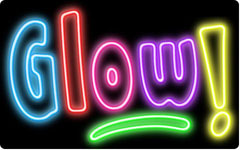 where can you find glow in the dark powder? This one is green but there are several different colors to choose from. My son saw a playdough commercial and asked if we had any playdough. No, but I bet I can find a recipe to make some. Sure enough! Thanks for posting this. I need to make this for 20 kids. What would the recipe be for a large batch? My playdough club will love this! hello I can’t believe you have 20 kids thats wierd how did you get them the good will!!!LOL!!! Will this work with food coloring? I don’t know where to find glow powder, but I have done this with the contents of a glow stick the effect wears off after a few hours but will keep longer if you put it in the frige or freezer when not being used. I also add regular food color. Add the glow stick juice at the end after cooking. Hello, first of all thanks for the post! Also, I have a question. I cant find glow in the dark powder, I have looked many times in store because I don’t have credit card to order online, but I do have glow in the dark fabric paint that I usually use for like everything. (including Halloween) do you think this would work instead? How long does play dough last? Do you have to keep it in the fridge? how long does the play dough glow?